Manor farm open - Saturday 5th December. Peg 22 middle. This is an area I've never done so well on but I was optimistic. The wind was awful whilst setting up so decided on a rod only approach... This soon changed after 40 mins in I had only 1 fish and then pole itus kicked in! 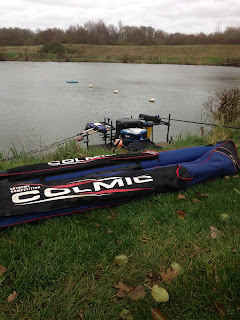 Kitted up the pole to fish 13m which I struggled but just about managed to do! At the half way stage I had around 6 fish and Rich Merry next peg had 5. One of my fish being 8 lb+! From this point everything dried up and couldn't get a bit anywhere and went 1 hour 30 without a fish. The wind got to bad to fish the pole to decided to under arm a bomb over it which picked me up a few more fish late on. Had 12 fish at the all out and weighed 40-0-0 for a section win! Early part of my match my pole line was solid but the winds cost me so many fish! I reckon I lost 10 fish! Still an enjoyable day none the less! Roll on next weekend! Didn't go Sunday, a day of kit prep!